This recipe comes to you all the way from Nashville, from a longtime family friend named Ava Parker whom we had the pleasure of staying with on our roadtrip to Kansas for the holidays. I remember Ava cooking a lot when her daughter Jenny and I were BFFs in grade school, but it was fun to connect with her about food now that I’m all grown up. Ava’s culinary influences hail from places as diverse as India and Hawaii. She lived in Paris, Nicaragua and Cameroon as a child (but says she never ate the monkey brains). She learned to make meatballs from an Italian neighbor who was supposed to be teaching her piano, and she once gleaned some cooking cues from a Persian-Lithuanian couple that lived next door. Ava taught microwave cooking classes when she and her husband Michael lived in DC as a young married couple, and she wrote a cooking column once upon a time (I’m rooting for her to start her own blog). She cooks “by taste, mood and feel, so writing the actual recipes down is a bit of a challenge.” But she did it for us! 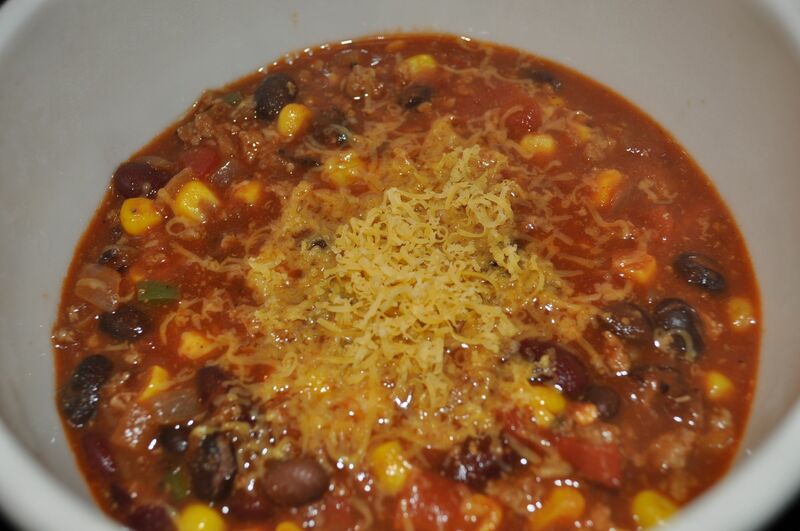 Below is the recipe for the Turkey Chili she had waiting for us when we pulled into Nashville — a great meal after a long drive, and on any wintry night, for that matter. 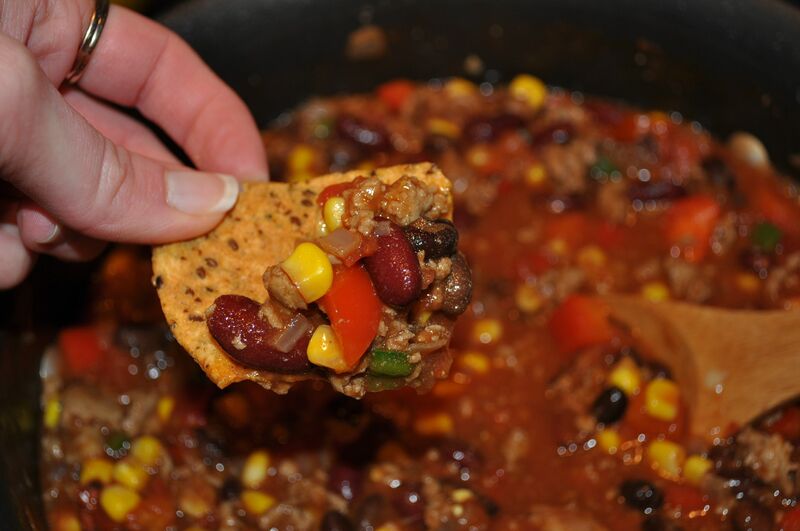 Everyone has there specific tastes and beliefs when it comes to Chili. Red beans, black beans, no beans (horrors) and then the choices of meats or meatless. I go with beans and meat. Slice up 2 slices of Trader Joe’s best thick cut bacon. Using a dutch oven type of pan, saute the bacon until cooked. 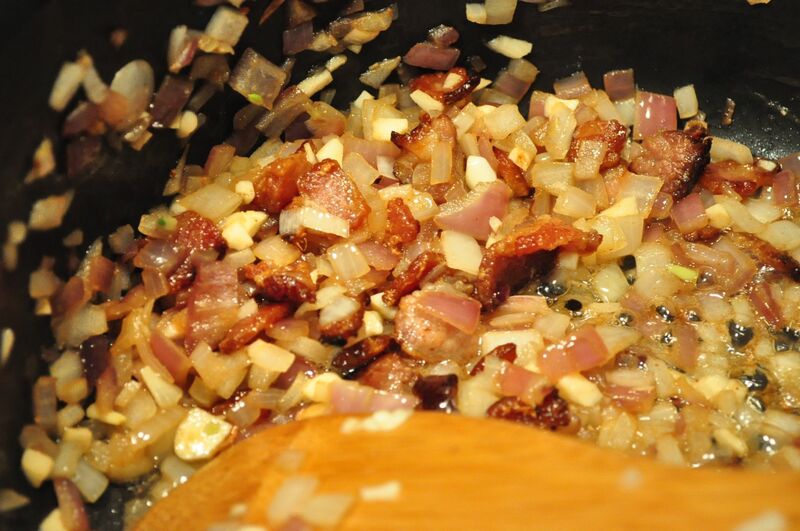 Then add the onions and garlic to the bacon and the fat (if not enough fat, add a bit of olive oil). Add the turkey along with the spices and cook until browned over medium heat. 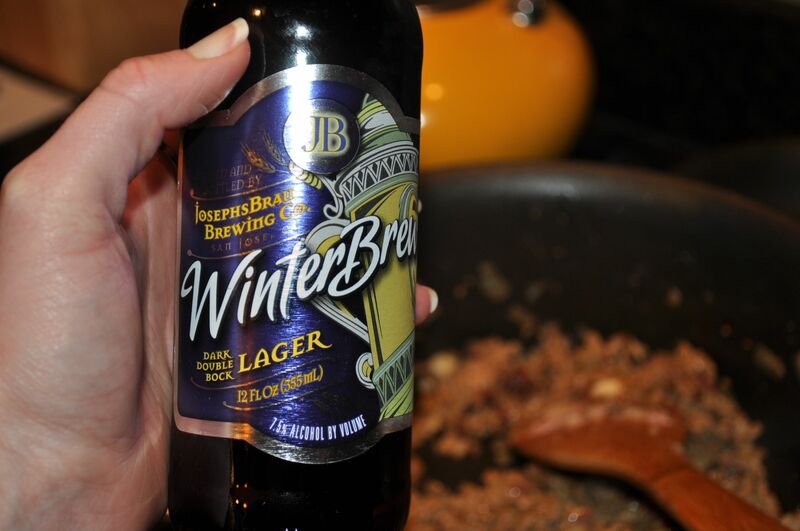 Pour the beer into the pot, add in the drained cans of beans, the tomatoes, and now mix in tomato paste until desired thickness. If too thick pour in some water. Lastly add the frozen corn, 1/2 pkg or less depending on how you think it looks. Simmer on low for as little as 30 min. to as long as 2 hrs. The timing depends on you, stirring and adding water if necessary. I serve this over rice which was cooked in chicken broth instead of water for deeper flavor. Top with a dollop of sour cream, shredded cheddar and hot sauce for those who want a bigger kick! So there you have my secret ingredients of beer, cinnamon and the corn! Thank you Ava for sharing this wonderful recipe. The cinnamon and bacon add an extra layer of flavor that almost turns into sweetness. But it’s just-right on the spicy, too!